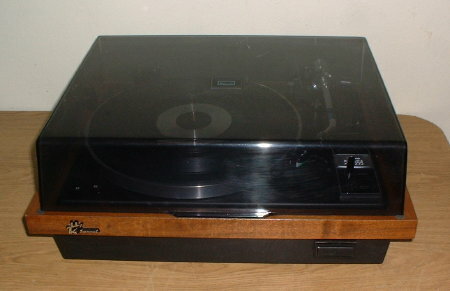 Classic Sansui FR-3060 Turntable in Fantastic Condition. This is one of the classics from the late 1960s/early 1970s. 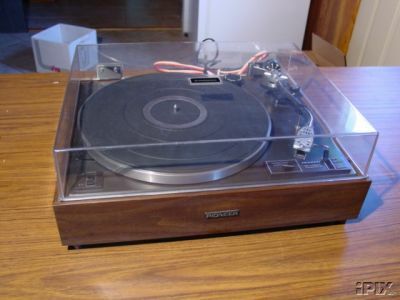 The Sansui FR-3060 is a belt-drive, fully automatic, very heavy turntable. Has two speeds: 33 and 45. The real gem of this turntable is the tonearm. It has a precision weight system to counteract skating force. This includes a small weight on a nylon line (this is often missing from these turntables). It also comes with an auxiliary counterweight so even very heavy cartridges can be used. When not needed, the auxiliary weight rests in a well at the rear. Controls include a precision cueing control, record size selector, Start/Cut and Repeat lever, and speed selector buttons. Measures 18-1/2" W x 14-1/4" D x 7-1/2" H. On the front of the turntable is a jack for a wired remote (not included). Comes with 45 adapter. Under the platter is a 50Hz pulley, and a 120V/240V switch, so the turntable can be used in other countries. Serial No. 323070764. If you want to estimate the shipping cost for this turntable, use the on-line UPS Cost Calculator. The shipping weight will be 30 lbs., and it will be shipped from Zip 75460.